Sometimes you stumble across an artist who has only a couple of comic based pieces, other times there can be just one work so brilliant, you'd risk being stoned to death by fellow art lovers for putting something else beside it. 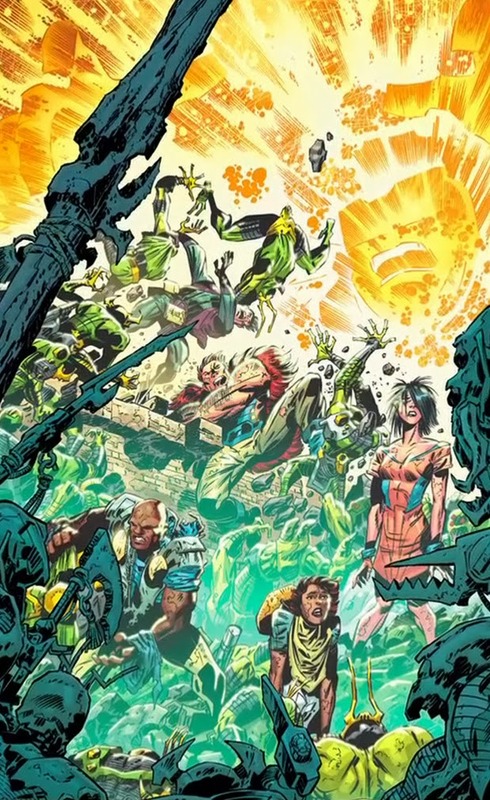 These are Random Works of Wow and illustrating the point this week is Keith Giffen and the Forever People. Heralding the launch of the June's Infinity Man and the Forever People, Giffen will re-team with OMAC creative partner Dan DiDio to write the title, while he and Scott Koblish will handle the art. Here, Giffen sure puts the 'Kirby' back into The King's famous 70's creation. Plus it is just great to see DC putting more stock into the creations of Kirby's Fourth World titles, rather than leave them to sit idly on the shelf. For those of you who are unaware of who the People are, think 'Captain Planet meets Terminator via flower power' (but one that came before the first two and at the height of the third). 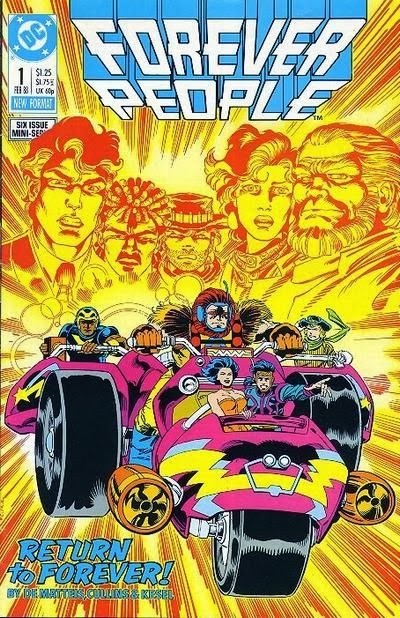 The Forever People were a group of free-spirited folk, sent as an advance guard to fight the influences of Darkseid on Earth. When they really got in a pickle, they could combine energies to summon The Infinity Man, to help when things looked bleak. I dug team ally Sumo most, but of the crew themselves, Beautiful Dreamer was always one of Kirby's best drawn women. Her powers and look really clicked with his style in ways only the likes of Big Barda and Marvel's Sif had beforehand. Infinity Man was the brother of the man who would become Darkseid, which was pretty sweet. With one of the coolest names ever, he and the team all effectively tied into communal cool Kirby creations like Motherboxes, The Source, and of course Boom Tubes. Not their first issue one, nor is the cover to the left, I wouldn't mind at all if the new series kept the look of this logo, along with the Super-Cycle as that thing never dates. With rumours floating of Booster Gold, Young Justice, Superman and ARGUS, and Nightwing and Bluebird also getting new titles for June, humour and counter-culture could well be making a comeback in the all too grim and gritty DCnU. And it's about time. I collected the Forever People when it first came out [yes showing my age there] along with Supermans Girl Friend Lois Lane [I bought it for the Thorn!] and of course FF. Remember it well, even tho I only managed to get occasional issues. Six years ago I picked up the FP Showcase Edition, which featured all the collected issues in one volume, NICE! Giffen;s faux Kirby art is sumptuous in its rendition and I am SO SO stoked that we will get a new FP series later this year! Cannot wait! You and me both Karl - this could well be a mass hit! OMAC was a really fun read, and I hope this will carry on that torch! It'll be curious how the Infinity Man will take prominent position in this new updated version - he only appeared in four of the eleven issues of the original run, and only then to rescue the kids from whatever danger they got themselves stuck in. One thing im unsure about is changing Serafin [that was the cowboy, btw] from a boy into a girl for this new look, but I will give it a go.